Canoe Hire On The River Wye - River Wye Canoe Hire & Kayak Hire - Wye Pursuits. CANOE HIRE ON THE RIVER WYE - BOOK NOW! You have come to the right place if you are looking for a fun, safe adventure!!!! In the beautiful Wye Valley. Perhaps you are thinking of getting away from the rat-race, with your family, your friends, your colleagues, maybe hiring a open canoe for a few hours, taking in the fantastic scenery through Symonds Yat or even get away from it all for a few days. Whatever you do, whoever you bring. It�s up to you! The Wye Valley really is the perfect setting for your very own outdoor adventure! At Wye Pursuits we are passionate about outdoor adventure, we are renowned for offering a highly professional, quality service, without sacrificing the fun! Our centre is based on the banks of the beautiful River Wye at Kerne Bridge, and from there we can offer quality canoe hire directly into the River Wye, making your day out so more convienient and safe. Click here for directions & here to contact us. The perfect setting for your own outdoor adventure! All the images displayed on this site are actual images taken by Wye Pursuits. 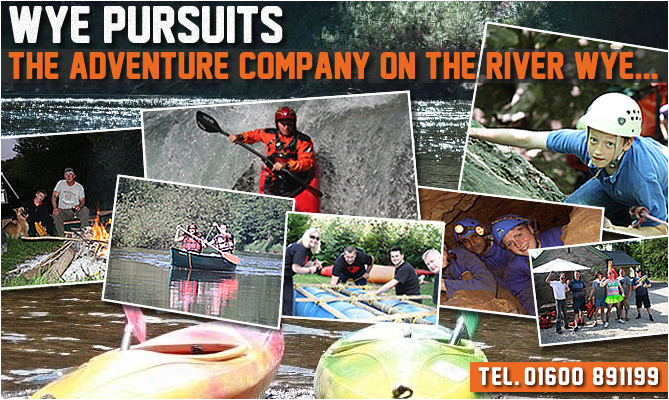 Wye Pursuits is an outdoor adventure company as you know based on the River Wye, and what ever the weather or the conditions we are able to offer activities for all levels of ability. But some of our regulars prefer certain weather days, and others are not to bothered, so to help those who would like to know the conditions, what trips are coming up, what courses are available, or anything else to do with the River Wye & Wye Pursuits, we have added Twitter, Facebook and a Blog to our website. They are updated daily, and it's worth subscribing or following the posts to keep yourself in the know.